Crypto Power Chlorella (Cryptomonadales Chlorella Sorokiniana) delivers up to 25% more nutrients to your body in the first two hours than the leading chlorella products. Crypto Power Chlorella is the only known alga in the world containing significant amounts of all three naturally occurring Alpha, Beta, and Gamma PPARs. Crypto Chlorella is a unique sub-strain of 95% digestible, green, single-cell soft cell chlorella sorokiniana that contains the blue pigment, phycocyanin. Unique to this select strain of chlorella, Cryptomonadales chlorella contains a significant amount of all three forms of natural PPARs. Peroxisome Proliferator Activated Receptors. Crypto Power ™ Chlorella (Cryptomonadales ® Crypto ™ Chlorella Sorokiniana) 95% digestible, single cell, thin soft cell-wall chlorella algae. 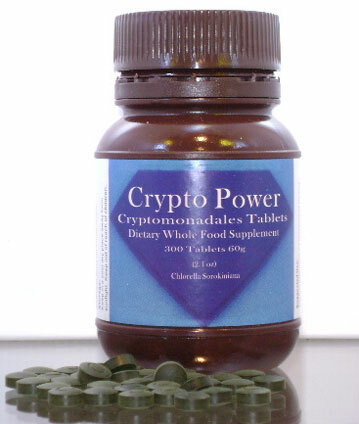 The registered international trade name for the USA brand name Crypto Power ™ Chlorella is: Cryptomonadales ® / Crypto ™ Chlorella. This select sub-species of chlorella sorokiniana is grown and processed solely by the International Chlorella Company of Taiwan. It is manufactured under World Health Organization GMP (good manufacturing practice) standards and carries the seal of quality and purity from the Taiwanese department of health. One of the oldest aquatic plantations and manufacturers, International Chlorella Co., Ltd in Taiwan, has researched in the world of chlorella for over 40 years. In 1992, a group of internationally well-known microbiologists, under the guidance of Prof. Dr. Wang Shun Te, succeeded in achieving their dream to discover a new strain of chlorella. The end result was a new superior single cell chlorella alga. Crypto Chlorella is a single cell, thin soft cell wall chlorella that is 95% digestible. Also unique to this rare form of nutrient rich chlorella are its green and blue components. Crypto Power Chlorella is one of the highest natural sources of chlorophyll and phycocyanin. Plus, it contains an abundant variety of micro nutrients not found in any other chlorella strain, including significant amounts of all natural alpha, beta and gamma PPARs. Peroxisome Proliferator Activated Receptors. 1. The soft cell wall. 2. A 95% digestibility rate. 3. Its high phycocyanin / chlorophyll content. 4. Its high natural PPARs content ( Peroxisome Proliferator Activated Receptors ). 5. The unique Cryptomonadales ® Chlorella Growth Factor (C.G.F.). CGF is not a single substance but contains a mixture of amino acids, vitamins, sugars and peptides particularly concentrated in the nucleic acids of RNA and DNA. Crypto Chlorella, contains 10% RNA and 3% DNA. Crypto Power Chlorella rich in PPARs, RNA and DNA, is, we believe, nature's most powerful adaptogen. Its combination of nutrients, including the highest combination of chlorophyll and phycocyanin among all known foods, make it the perfect choice for your over all health. Crypto Power Chlorella , Cryptomonadales, crypto chlorella sorokiniana, has a 95% digestibility rate within two hours. The leading chlorella pyrenoidosa product, even with a special patented broken cell wall process, only delivers up to an 85% digestibility rate within five hours (barely 70% in two hours). Crypto Power Chlorella, Crypto soft cell wall chlorella, delivers up to 25% more nutrients in the first two hours than the leading chlorella product. Plus the nutritional content of Crypto Power Chlorella is the most varied and richest of any of the over 20 different strains of chlorella. Until now chlorella pyrenoidosa reigned supreme among the families of green foods and edible algae. With proper processing, pyrenoidosa's hard outer cell-wall could be broken down to yield an amazing 85% digestibility rate over 5 hours. Crypto Power Chlorella, Crypto soft cell wall chlorella sorokiniana, has a 95 % digestibility rate in 2 hours and it contains a much richer array of nutrients. This is a truly raw, vegan, whole super food, never processed above 140 degrees F.
Cryptomonadales Soft Cell Wall Crypto Chlorella Sorokiniana. • The entire sorokiniana soft cell wall chlorella is edible; 95 % digestion by your body in 2 hours. Compare that to the leading hard cell wall pyrenoidosa chlorella, 85 % in 5 hours. • Crypto Power chlorella contains a high amount of protein with a balanced composition of essential amino acids. • Crypto Chlorella has the ability to help convert acidic body fluid into a slightly alkaline condition. * It is a known fact that disease thrives in an acid environment. The registered international trade name for the USA brand name Crypto Power ™ Chlorella is: Cryptomonadales ® / Crypto ™ Chlorella. This unique sub-species of soft cell wall chlorella sorokiniana is grown and processed solely by the International Chlorella Company of Taiwan. Out of over 20 different strains of chlorella, the International Chlorella Co of Taiwan is the only chlorella grower in the world cultivating 100% Cryptomonadales ® / Crypto ™ chlorella sorokiniana, which is the most uniquely nutritious strain of chlorella. We know that any product is only as good as its ability to be used by the body. It's not the amount of nutrients you consume but the amount you utilize that makes the difference. Whole foods like Crypto Power ™ Chlorella, Crypto chlorella sorokiniana, ensure the highest level of digestibility (95%) and assimilation. Crypto Power ™ Chlorella, Crypto chlorella, is manufactured under World Health Organization GMP (good manufacturing practice) standards and carries the seal of quality and purity from the Taiwanese department of health. Crypto Power Chlorella, Cryptomonadales, Crypto Chlorella Sorokiniana, is the one supplement, we believe, which outshines anything else we've encountered for the past 25 years in our search for excellent products. It is absolutely "the best", and we strongly encourage adults and children, healthy or not-so-healthy, dogs, cats, fish and plants to take this great whole food daily. Requires additional processing to break down the hard cell wall, such as milling, heat, chemicals or ultrasonic. 80% in 5 hours. No additional processing required. During the culture period cells are very stable and will not change shape. During the culture period cells often change from a spiral to a line shape. This line type algae is not a safe food. This is a major danger of spirulina harvested in the wild. For this reason we recommend only lab supervised cultured and cultivated Spirulina. During the culture period, cells are very stable and will not change shape. Contains an abundant amount of Chlorophyll (Green) but lacks Phycocyanin (blue). Contains significant amounts of all natural Alpha, Beta and Gamma PPARs. crop environmental conditions and testing methods used. We would like to encourage you to try Crypto Power Chlorella for at least three months and discover for yourself its superior benefits. International online orders for Crypto Power Chlorella please click here.